ZEN BODY SENSE 2009 Welcome To Our Bedtime Stories. Having your Cake & Eating it! Doctor . . . Changing Heads A theatrical drama satirizing how the media dominates a person? ?s life! Story in the Pictures - ? ?PRAN-A-LUXE Exclusive Trip?? 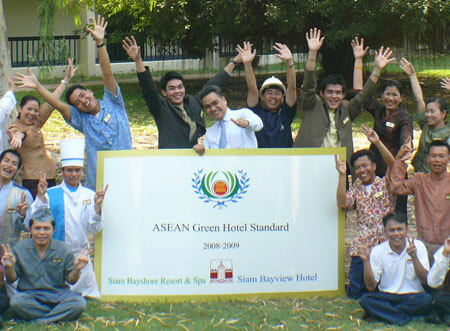 The two Pattaya properties of Siam City Hotels & Resorts, the Siam Bayshore Resort & Spa and Siam Bayview Hotel, have both won Asean Green Hotel Recognition Awards 2008 for outstanding efforts in environmental conservation. Only 10 hotels in Thailand received these awards, which were presented during the Asean Tourism Forum in Bangkok in January 2008 by Dr. Suvit Yodmani, Thailand’s previous Minister of Tourism & Sports, and Asean Secretary-General Dr. Surin Pitsuwan. 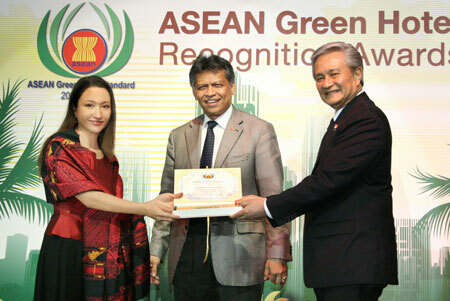 All winning hotels reached or exceeded the Asean Green Hotel Standards, which are based on Thailand’s Green Leaf Foundation programme, initiated by Dr. Suvit himself 16 years ago. The Siam Bayshore and Siam Bayview have been active members of the Green Leaf Foundation since 1997, achieving the maximum “5 Leaf” certification annually for the past five years. “With global warming issues becoming critical, every organisation needs to adopt environmentally friendly practices for the benefit of the community. We want to set an environmental example for other hotels, which we hope they will follow to ensure the preservation and sustainability of Thailand’s tourism industry,” comments Ms. Marisa Sukosol-Nunbhakdi, Vice President of Siam City Hotels & Resorts. Each of our hotels has an environmental committee, which recommends, implements and ensures the quality of “green” practices to be used in the hotel. The committee also organizes training and awareness campaigns that involve staff, guests and the local community. “We encourage our staff to be responsible for the environment. Their involvement and commitment are the keys to our success and their personal benefit,“ explains Mr. Saran Nimihut, Siam City’s Regional General Manager, who has overseen the participation in Green Leaf from the start. • Waste management and reduction through waste separation, recycling, bulk buying and using returnable and recyclable containers. Hazardous waste is always carefully separated and handled. At the Siam Bayshore, compost is made in-house and utilized on its trees and gardens covering almost 40 rai (approx. 6.4 hectares). • Wastewater is piped directly to Pattaya’s wastewater treatment plants, while we only use environmentally safe detergents and cleaning agents within our hotels. Grease collectors are installed in all kitchens and emptied into special containers for garbage disposal three times a week. • Efficient use of water is encouraged and promoted among all staff and guests. Low consumption bathroom fittings help save water, leakage is monitored and consumption sub-meters are installed in heavy-usage areas, such as kitchens and laundry. • Energy-saving measures are implemented, coupled with investments in technology and equipment that help reduce environmental impact and consumption. These include energy-saving light bulbs, individual light and air-conditioning switches, effective management of fuel and gas, installation of environmentally friendly air-conditioning systems that utilize ozone-friendly R134A agents. • Air pollution has been reduced through the installation of new boilers and heat pumps, which run on LPG gas instead of heavy diesel fuel. • Cooling towers have been upgraded on both properties to improve hot-air ventilation, thereby reducing energy consumption. Leading German tour operator TUI presented Siam Bayshore Resort & Spa its Environmental Champion Award in 2004 and 2005. Both the Siam Bayview and Siam Bayshore received the EIA (Environmental Impact Assessment) Monitoring Awards in 2005 and 2007, which were given by the Office of Natural Resources and Environmental Policy and Planning in recognition of the hotels’ efforts in minimizing environmental impact. In 2007, the hotels received “Awards for Environmental Friendly Hotel” at the Tourism Authority of Thailand’s Tourism Awards Ceremony, in recognition of their ongoing culture of environmental conservation and management. They also joined the Smoke-Free Hotel Programme initiated by the Green Leaf Foundation to promote a healthy atmosphere within their properties.